Hi I’m Michelle, I run/abandon/run this blog. 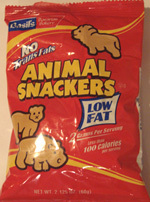 I got the idea for this in 2008 while on vacation, my husband Ethan and I were checking out the vending machine by the pool and noticed one of the offerings was a product called “Animal Snackers”. Amused by the blatant rip-off of “Animal Crackers”, we started discussing what other products were rip-offs or “lesser” versions of more popular brand name snack foods. Thus began our new hobby of roaming up and down the aisles of grocery stores and mini-marts, looking at packages and researching online. I have to say, I have learned a lot. I conduct taste-tests with the help of Ethan, my friends and my co-workers. I’m always grateful for their feedback and of course always interested hearing readers’ thoughts on these products. Also, although I feel it’s obvious, this blog is for fun, not to be taken seriously, as a hobby etc… not to get upset or offensive about, really. I say this because some of the comments that I end up deleting because they are mean spirited (yes, over a snack blog) or want to lecture on how unhealthy these non-health food items are. P.S. I’d also like to add that all opinions of foods described here is purely my own, Ethan’s or that of our guest tasters. Please don’t be offended if we didn’t like something you like. It doesn’t mean we think people have bad taste for liking what we don’t. In fact we’d love to be enlightened by people who have had different experiences with the same food. Feel free to share your thoughts by leaving a comment. You’re after me lucky charms!